A humpback whale is swimming free after being untangled from mooring lines near Prince of Wales Island on Thanksgiving Day. A NOAA biologist and a local pilot postponed their holiday meal to do the delicate work. Dr. Fred Sharpe with the North Pacific Large Whale Entanglement Response Team was flown to Sarkar Cove on Prince of Wales Island, about 16 miles due west of Coffman Cove, on Wednesday, November 21. Sharpe is from the Alaska Whale Foundation. According to a news release from the National Oceanic and Atmospheric Administration, the entanglement was potentially life-threatening. 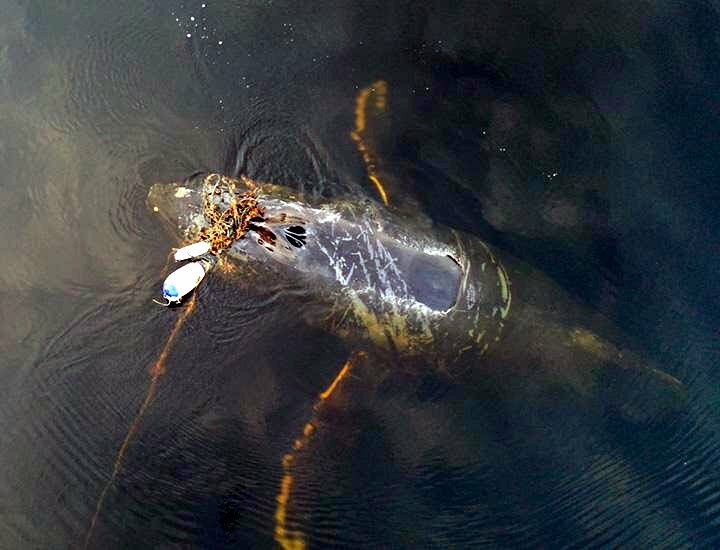 The sub-adult whale was entangled around the upper jaw in heavy gauge lines used for mooring docks. There were two buoys in the entangled lines, and a dense snarl of smaller lines about the size of an ice chest. Several of the lines covered the leading edge of the whale’s blowhole. Due to poor weather on Wednesday, Sharpe and pilot Scott Van Valin, the owner of the nearby El Capitan Lodge, decided to try and disentangle the whale on Thursday. After several attempts to approach the agitated animal, Sharpe used carbon fiber poles equipped with specialized knives to cut the whale free about 30 minutes before sunset. The was was last seen heading north out of Sarkar Cove. NOAA reminds all mariners to be vigilant for entangled marine mammals, but advises them not to attempt disentanglement on their own. Reports of entanglements can be relayed through the Coast Guard on VHF radio channel 16, or by calling the Alaska Marine Mammal Stranding Hotline at 877-925-7773.